A meaningful and practical way to give family and friends a keepsake of your departed loved one. Losing a loved one is difficult. Whether it was expected or not, a formal announcement will most likely occur among family and friends. 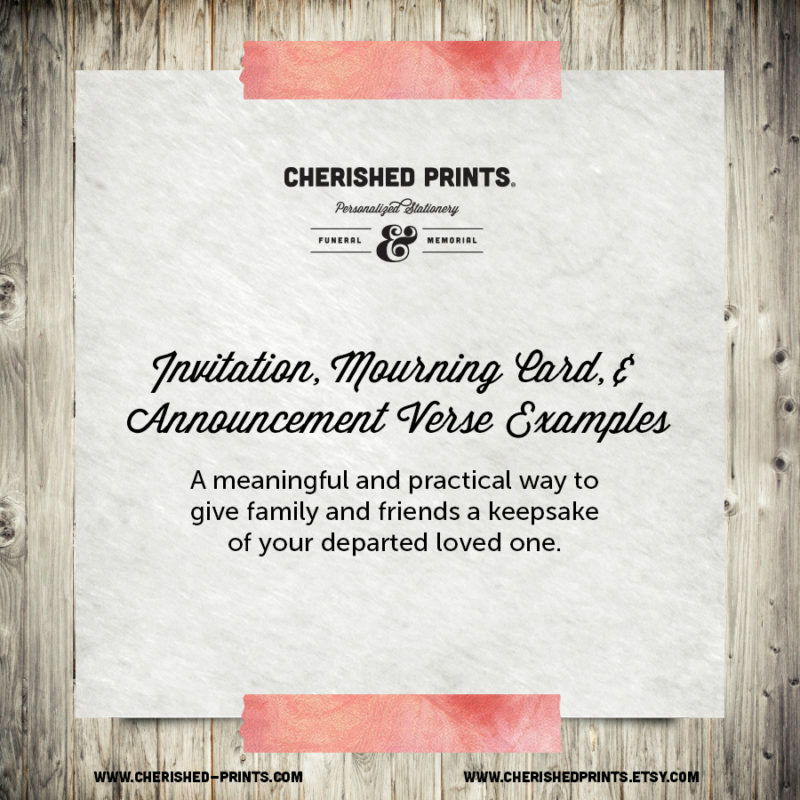 Below are several funeral announcement wording examples for different types of ceremonies; i.e. a Celebration of Life, Funeral Service, Memorial Service, Scattering of Ashes, and Monument Placing. If you don’t see one that fit. Don’t worry. I can help customize an invitation or announcement for you. grandfather of Evan, Adrian and Marshall. at a ceremony of final disposition. Saturday, September 20, 2016, 2:00 p.m. The ship will set sail at 2:30 p.m. Please bring your fondest memories of Jane. Monday, September 22, 2016 at 10:00 a.m.
123 Main St., Somewhere, Ohio. This entry was posted in Blog, Library, Verses. Bookmark the permalink.